Recently I went to the Davis Farmers Market on a Wednesday evening to do a bit of sketching. It was a warm evening, as you get around here, and a lot of people were buzzing around getting food from vendors and listening to live music. It’s always tricky figuring out what to sketch; in order to capture the vibrancy of the scene, you need to sketch a bunch of people moving around. 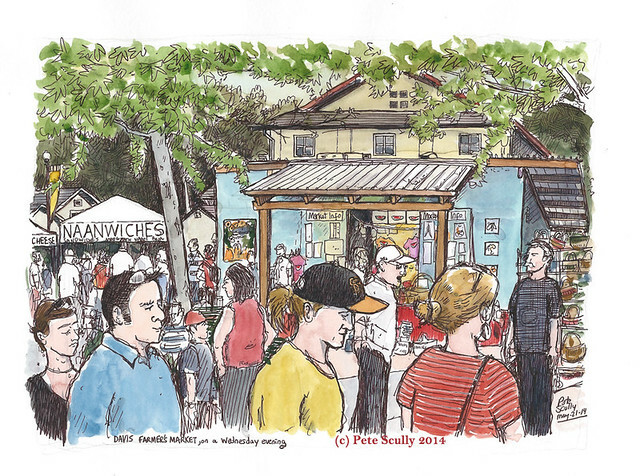 I chose a spot near the food vendors and sketched the market information building, which sells t-shirts and baskets and other such stuff, while a queue of people lined up before me for tacos, finding themselves inevitably the foreground subjects of my sketch. I stood holding my big sketchbook (the larger size Stillman and Birn Alpha book rather than my smaller everyday sketchbook) at an unusual angle, I look kinda funny when I sketch like that. Someone came to look at my work, but they were at the wrong angle and probably thought I was holding it up so they couldn’t see, but that’s just how I hold it, close to my chin like a violin. I had time that evening so added the paint on site, sitting down on one of those benches by the tree to do that. I didn’t eat a Naanwich or any other of the market foods, I can’t really eat and sketch. Anyway this particular sketch (and several others) will be on display and for sale this month at the ‘Art Is Davis’ Co-op on D Street, Davis, as part of the ‘Scene In Davis‘ show. 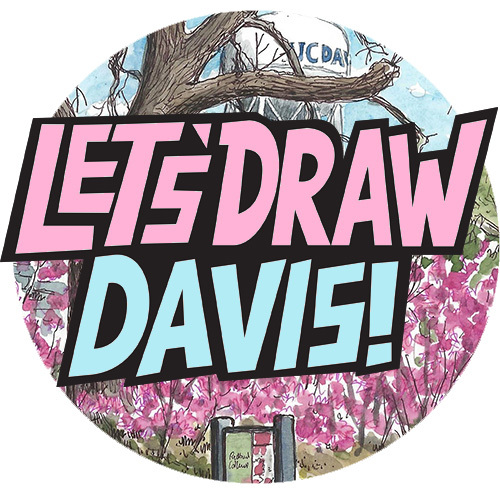 We will be having an artist’s reception in the early evening of Friday June 13th, so if you are in Davis please do come by, look at some of my sketchbooks, and say hello! You have captured the atmosphere and definitely the vibrancy with this sketch.